Coober Pedy is a MUST... on my list of things to do! My first glimpse of Coober Pedy and first experience of the Outback was watching what has now become a cult movie - the Adventures of Priscilla, Queen of the Desert. I have watched this Oscar winning film countless times and each time, I have longed to visit the amazing places where the film was shot. 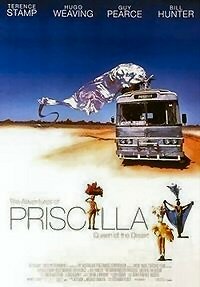 The film is about two drag queens and a transsexual who travel across the Outback from Sydney to Alice Springs in a large bus called Priscilla. Along the way, they have numerous hilarious adventures, lost in the desert or encountering the locals in places like Coober Pedy. When I found your website B, I was immediately drawn to the pages on Coober Pedy and wow, what a fascinating place it really is. Especially, when I read that the food is amazing and that the underground homes/hotels are the coolest things imaginable. Every time I come back to your site to learn about your latest adventure, it makes me think of that film again and what fun it would be to drive across the Outback myself in a big pink bus! And to visit Coober Pedy and Ayers Rock and oh so many other amazing places. I made it to New Zealand a few years back (only had a few weeks and no time to do Oz as well) but your site has inspired me to make a trip to the Outback sooner rather than later. I currently live in Cyprus and started a mountain bike business a couple of years ago with my husband so I won't make it outback this year. But watch out, I'll be back as soon as I can, asking where I can get hold of a pink bus! Thanks for the inspiration B! Comments for Coober Pedy is a MUST... on my list of things to do! I love your enthusiasm! If you liked what you saw in Priscilla you will love Coober Pedy. It's definitely a one of a kind town. Good luck for your new business and hopefully you'll make it outback soon! If you're excited about Coober Pedy now, wait until you get there! It's out of this world. What I wanted to let you knows was, you must also get out to the Breakaways while at Coober Pedy, amazing scenery. Yes I went to Australia in 2005. Wonderful, wonderful place! Especially Coober Pedy. Radenkers, the Underground Museum, I stayed at the Cave Hotel...definitely worth the experience. Somewhat expensive but understandable because of its locality. Water is at a premium, so you must respect it! The Opal mines and as mentioned by one of the posters above, the Breakaways are beautiful. We also went on an organized tour out to the Dog Fence. Yes, Australia is a must!! Make sure you use the Greyhound Kilometer pass when you need it!